Mechanical Pegs Now Available at Gamut Music — Gamut Music. Inc. It is rare for there to be a technological advance in historical instruments but there is a great advance now available from the Peghed Company in the form of a geared lute peg. Mechanical pegs represent a revolution is lute tuning. Each peg shaft is constructed with a planetary-gear mechanism that allows very fine tuning of the string. The gear has a 4:1 ratio which means that the peg head needs to be turned four times for the shaft to complete one revolution around. The peg also has a break mechanism so the string will tension not turn the peg and each has variable friction so you can push the peg into the peg box to increase the resistance or pull it out to decrease the resistance. 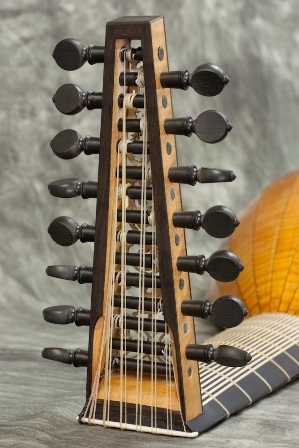 These pegs are exactly the same weight as an ebony peg, so they don’t make the instrument heavy and unbalanced and they fit into the same holes as a standard lute peg. You can only tell the difference between the mechanical peg and a friction peg if you look very closely. These pegs offer several advantages over traditional, friction pegs: primarily, they don’t slip and allow a string to go slack and require re-settling. They also allow for tuning in extremely fine increments allowing for more accurate and easier tuning. All of these features are good; but the biggest advantage is that they require little effort to turn and your hand does not become strained while tuning. This can make your left hand more relaxed for playing and that can make the difference between a good performance and a bad performance. 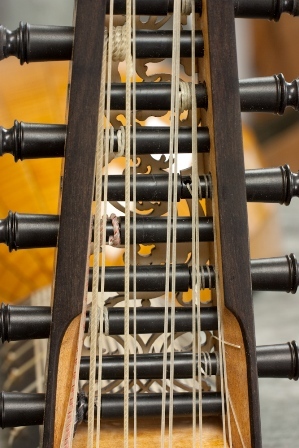 If the old story, that a musician that has played the lute for thirty years has spent fifteen of them tuning is true, then using the mechanical peg could reduce that to a few years and provide you many more years of actually playing during your carrier with the lute. These pegs are expensive but they will save you many hours of frustration in tuning your instrument. Compared with other types of pegs the Peghed is a little heavier, and the relative weights of different types of pegs are below. These are average weights taken from pegs with 9cm shafts. When making an instrument that will utilize the mechanical pegs it is easy to lighten other parts of the head so that there is no resulting net gain in the weight or balance of the instrument when gears are used. 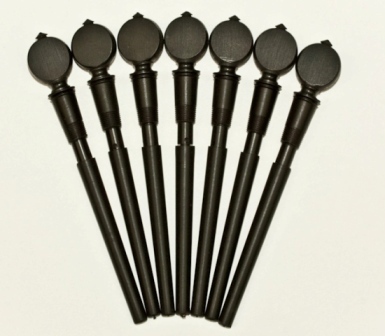 Peghed geared lute pegs are now available as an option for all Larson lutes guitars and vihuelas. Please consult the instrument pages in the catalog for pricing. Posted on March 25, 2012 by Daniel Larson.